It is not every day a group of students are asked to create art in the middle of an archaeological dig site. Needless to say, the inter-department collaboration between Art and Archaeology was an interesting display of how interdisciplinary content can create an exciting dialogue which my be explored through different materials. As Artists in Residence, we had the opportunity to learn about the archaeological process, which was thorough and well calculated. On the 15th July 2016 at sunset, a group of archaeology students gather around a lit fire pit set in amongst Holly Shoesmith’s circle of stone monoliths, which soon start emitting an eerie groan. The assembled group began to circle the pit in a trance, the fire gaining a stronger presence as the sun sets behind the uplands. Pam Rose-Cott appears dressed in Neolithic regalia, her face covered in war paint. She takes a seat by the fire, and invites the group to participate in a guided meditation that emits from the stones themselves. The meditation continued with increasingly heavy breathing stimulating a memorizing mental trip through time. The climax resulted in a procession to the waterlogged trench ‘I’ where a symbolic baptism proceeded. Throughout the intensive experience Will Cunnington sculpted clay pottery. The audience was entirely different from what we had come to expect from the art department; the archaeology students were not necessarily familiar with contemporary art, so it was interesting to see how they would react to our work. We were delighted to see, on the day of Holly’s and Pam’s performance, the archaeology students fully immersed themselves in the experience, with some literally immersing themselves in the trench baptism. Aside from live immersive work, Molly Harcombe created pieces based on this process, creating her own ‘finds’ which she placed in trenches to be discovered on the field school’s open day. Sarah Pritchard analyzed the relationship between work and rest through a ‘zine and a biscuit covered trowel. The trenches provided some creative inspiration for a number of the students; Adam Stead used 3D scanning technology to create 3D prints of the trenches. 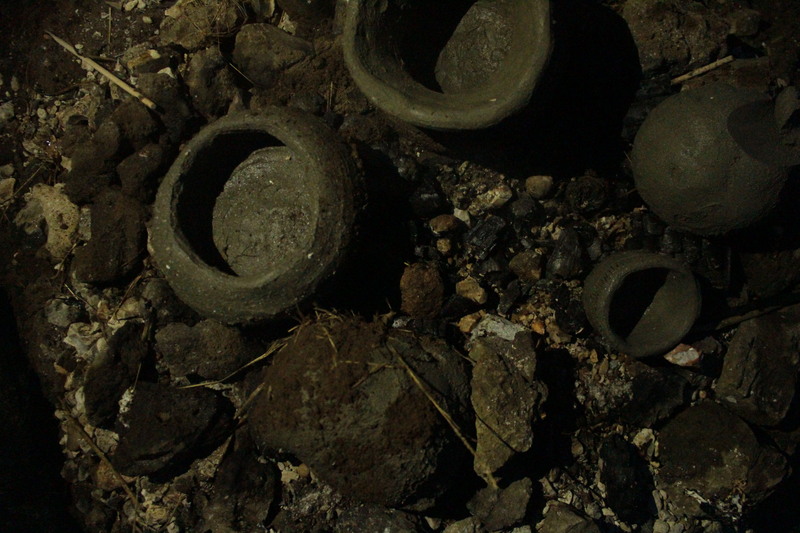 William Cunningham took a more hands on approach, creating pottery with clay from trench I, which he then set using the fire pit from Pam Rose Cottrell and Holly Shoesmith’s aforementioned performance and installation. The clay was used again in Daisy Evans’ sunset ritual to cover her body in a performance piece about returning to the earth and reveling in natural material. We all had a unique interpretation the historical and cultural context of the dig, Yun-Yun Lee creating cross-cultural golden ‘rice henges’ which she hid in various locations around the dig site, aiming to guide visitors on the open day around the site. The scientific and technological approach undertaken on site was impressive, especially the use of modern ground surveying technologies to locate archeological features for future exploration. Numerous workshops and trips were organized to stimulate creativity within the ritualistic historical environment we found ourselves in. Emphasis was made in recording, as an archaeologist’s job is to ‘destroy and record’, thus a number of drawing and printing workshops took place in response to this. Sebastian Sussman, an archaeologist by profession, ran a cyanotype-printing workshop, where we used found objects to see what negative space they would print when exposed to sunlight. 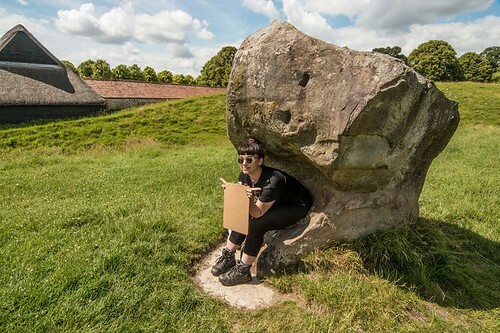 Claire Nolan led a mindfulness walk in which we intuitively and spiritually experienced the landscape, discussing and recording guttural responses the environment evoked in us. This was a cathartic break from the dig that allowed us to connect with the ancient landscape and consider how it may cause us to think and feel. This was an opportunity to explore our inner selves in an environment that sought no particular end product or requirement. An exciting opportunity came in the form of a visit to the Wiltshire museum, where a number of artifacts from the surrounding area are stored. We were delighted to discover the museum will be hosting an art exhibition during the summer of 2017 based on the work students developed from their experience in the 2016 field school. This will give us the opportunity to think about what we have seen and experienced, and to create work inspired by a methodology we would not experience in the art world alone.